If C. Mildred Thompson was the most formidable Dean of Vassar College in the twentieth century, Marion Tait was surely the most beloved. Appointed to the venerable position--its title was later changed to Dean of the Faculty--in 1948, when she was only 37 years old, Miss Tait (as she was known all her life) followed in the stern footsteps of Miss Thompson, Dean since 1923. Miss Thompson was known throughout the Vassar community as a model of brisk administrative efficiency and old-fashioned formality (with, to be sure, a degree of despotism). Marion Tait, on the other hand, although efficiency was her middle name, from the beginning of her long tenure leavened her formal side –it definitely existed—with warmth, irony, and a piquant sense of humor. She lacked the starch of her predecessor. Those who knew her would add that charm, that famously ineffable quality, formed the true core of her being and, as it was combined with her sharp intelligence, made possible her success and longevity in office. Miss Tait was born in Saskatoon, Saskatchewan in 1911. When her father, Robert Tait, died in the influenza epidemic of 1918, her mother relocated the family to Ontario. The young Marion was educated in the public schools of Preston, Ontario and at the nearby Galt Collegiate Institute, where she earned an unprecedented thirteen "firsts". She proceeded to the University of Toronto (Victoria College), with its large and distinguished Classics department, to which she was attracted because, as she told an interviewer in 1949, "if one was to understand anything, it seemed important to begin at the beginning." In the same interview, she conjures up her earlier self, remembering that she "belonged to a group that considered itself intellectual, radical, and oh, so sophisticated." And: "we were women, not girls." She and her friends, finding athletics boring, "read T. S. Eliot, D. H. Lawrence, and Freud." An even younger Marion had displayed a characteristic independent and adventurous streak when, at age four, she wandered away from home to join a passing parade on Main Street, an excursion from which a policeman returned her to her worried mother. In later years, she liked to describe other parades and rallies she had experienced, such as those honoring Mussolini in the years preceding World War II, when she was studying at the American Academy in Rome. The fever pitch of those particular occasions she found both thrilling and appalling, and she spoke of them, over a martini or two, with intensity and relish. As Marion Tait's undergraduate education was nearing its completion at Toronto in 1934, her professors, she later recalled, pointed out that more plentiful and interesting possibilities for women academics existed in the U.S. than in Canada. She decided, therefore, having stayed at Toronto another year to earn an M.A., to move south, and in 1939 received her Ph.D. in Latin from Bryn Mawr, where she also taught briefly, as she did also at Sweet Briar. By the time of her appointment to Vassar, she had become a tenured associate professor in the Greek and Latin department at Mount Holyoke, so the milieu she knew best was that of women's education in the liberal arts tradition. Although she was considered a Latinist professionally, her deepest interest probably lay on the Hellenic side, as her most significant publication, an article entitled "The Tragic Philosophy of the Iliad," published in the Transactions and Proceedings of the American Philological Association in 1943, illustrates. An early summer residency (1937) at the American School of Classical Studies at Athens deeply impressed her, and later in life, at the time of her retirement from Vassar in 1976, she returned to Athens and lived and worked at the School for a year, pursuing a project on the Homeric simile, an endeavor that remained unfinished at her death. The Vassar of 1948, when Miss Tait became Dean, was deeply divided over the issue of whether the college should return to a four-year cycle or remain on the three-year plan of the war years. Faculty members passionately advocated one or the other of the possibilities. Long friendships foundered in a disagreement that threatened to become insoluble. A colleague of Miss Tait's from that period noted that "there were those members of the faculty who could not yet bear to speak to each other if they could avoid doing so by switching their routes through Main to the post office." But Dean Tait, with fresh openness, found the way to calm these troubled waters. She listened to all who cared to meet with her. She offered patient and sympathetic counsel. And she gradually formed her own deep conviction that Vassar must return to its former calendar and curricular model. Such was her advice to President Sarah Gibson Blanding, who had succeeded the legendary Henry Noble MacCracken just two years earlier, and so indeed the reversion was made. Dean Tait did not harbor critical views of those who argued for the other route. As another colleague put it, "she was tactful and got on with everybody, with her cool, balanced attitude and pleasant warmth." A reflection of this can be deduced from her refusal, in faculty meetings, to sit on the dais with the president, as Dean Thompson had done while watching closely how the faculty voted on the issues before them. Instead, Miss Tait sat in the first row with her faculty colleagues, indicating that she was one of them and considered herself their champion. She listened to what she heard, and she spoke only when necessary. It was a formula that worked brilliantly, and every Dean of the Faculty since has followed her lead. Now, I don't pretend to know Dr. MacCracken's train of thought from that time to the evolution of the Vassar College matriculation pledge, but after all, one doesn't need to—all we have to do is recapture for ourselves moments when we have seen the past confronting the present with a vivid and startling reassertion of immortality. Even though you might not number Copernicus among your predecessors, I know, even from last year's experience, and you know, how satisfying it is to turn and examine the pages of Vassar College's matricula. Here is incorporated always our reminder that the present lies in the past, the past in the present, and the future in the past and present. In the 1950s, Vassar found itself confronting the hysterical anti-Communism and suspicion of colleges and universities that was stirred up by the House Committee on Un-American Activities and Senator Joseph McCarthy. President Blanding offered staunch support to her faculty and their rights of free speech. 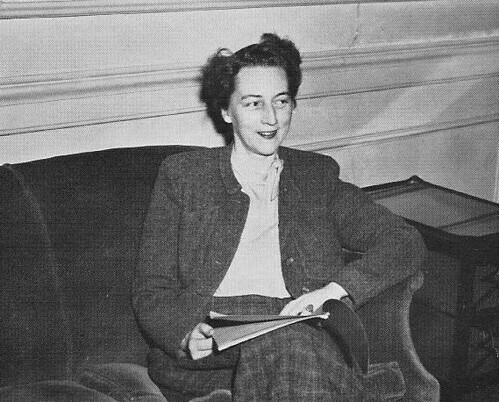 Marion Tait, for her part, calmly defended the principles and purposes of a liberal arts education in a deceptively simply statement to the faculty in the fall of 1952: "There are only two essentials in the process of a liberal education: the story of humanity and the way the individual student comes in touch with it." This statement, a kind of creed, became the touchstone of her leadership in the decade that followed and strengthened her resolve that Vassar should remain a traditional college and not be transformed into a technocracy. She believed in the nurturing bond that joined professor and student, just as she supported the notion that a balance between research and teaching (and service) had to be achieved, and that it be fair to the faculty while at the same time affirming the symbiotic relationship between distinguished scholarship or artistic achievement and teaching of the highest order. Her resolve was tested severely in 1959, when the Vassar trustees seemed on the verge of Draconian cuts that would have introduced a 20 to 1 student/faculty ratio and pared and altered the curriculum. Dean Tait stood in a faculty meeting and accused the trustees of ignoring or subverting the tenets of the college's Governance, introduced in 1915 by MacCracken, a document that had become an exemplar for other institutions. The chief of these tenets, underlying all else, was the right of the faculty to determine educational policy. She called upon the faculty to rise up and defend their own cause. They did; in a short time, they and the trustees resolved their differences amicably, in a way that preserved Vassar as it had evolved since 1861. Marion Tait's retirement as Dean coincided with the arrival of Alan Simpson as the new president in 1964. After 17 years of continuous service in her role as chief academic officer, she decided it was time to pass the reins to a new dean and return to teaching. There were those who believed that she found working with President Blanding, a rather rigid and opinionated person, increasingly difficult, though Miss Tait remained loyally mute on that point. One can imagine, however, that she also saw the great hurdle of co-education on the horizon. Indeed, the decision to embrace co-education was made just two years later. It had Marion Tait's firm endorsement, but at that point in her life, she gladly let others work through the complexities of its achievement. Once in place, co-education at Vassar had not only her approval but her fervent support, and she confided in friends her delight at teaching men after her immersion for so many years in all-female academic environments. As it turned out, her presiding over classes on Plato and Vergil and Horace was to be interrupted again. In 1970, President Simpson called her back to serve one last time as Dean of the Faculty while a search was carried on to appoint a new dean. This she gladly did, after which she returned yet again to join her colleague James Day and to teach for four years before retiring. Throughout those final years at Vassar, she was called upon again and again to render advice on issues large and small. In a sense, she remained the leader of the faculty even after she left the deanship, as was evident the day in 1973 when she stood up in a faculty meeting and calmly rounded on Alan Simpson for having, as she put it, "conspired" with the trustees to impose a faculty salary freeze without so much as a moment' s consultation with the faculty itself. This attack carried force, and it worked. The freeze was cancelled. Miss Tait retired to Massachusetts, where she lived for only six more years--a very happy time for her --with her companion Helen Codere, an eminent anthropologist who had taught at Vassar in the late 1950s and later became Dean of the Graduate School at Brandeis. Two houses were shared in succession in the suburbs of Boston, as was a simple cabin in the woods of Vermont that lacked running water. The rusticity of their Vermont place, though it surprised some of their friends, seemed just the right counterpoint to the sophistication of these two women of the world. During her retirement Marion Tait seldom returned to Poughkeepsie, though she traveled abroad, gardened, worked on Homer, read many murder mysteries, and loved the birds that flew to her feeder. She died of cancer, at the age of 70, in 1982.